The Salford Valmar 55 Series implement-mount applicator is designed to deliver unparalleled accuracy under a wide variety of ground conditions. 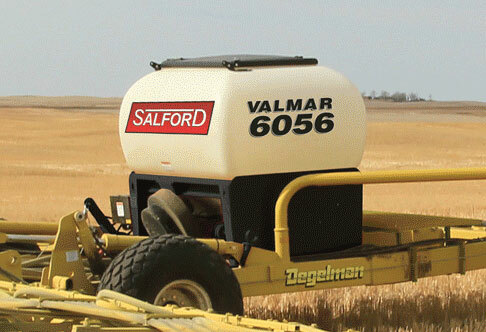 The Salford Valmar 56 Series implement-mount applicator builds on the tried and tested 55 Series applicators with poly tanks for a wider variety of applications and even greater longevity. A hydraulically engaged metering system provides consistent application rates regardless of ground speed. Designed to deliver unparalleled accuracy under a wide variety of ground conditions. Maximize the nutrient value and palatability of your hay with efficient, air-driven application and extremely accurate metering from Salford Valmar.